At around 3:45, in the afternoon, Dhanmondi Kakoli School is vibrant with the chimes of ghunghur. Its source is the dance class of the first year (junior section) on the ground floor. More than eighty children, between five and six, are busy following the steps shown by their teachers, one male and another female. The classroom is far too small for such a large group of would-be dancers. But the teachers as well as the students seem impervious to the matter; they are too engrossed in the art. The male teacher AH Tapan has been teaching here for the last ten years. He himself finished his certificate course on classical dance in 1992 and three years later joined as the teacher of the same school. Kakoli school is one of the two branches that the Bulbul Academy of Fine Arts (BAFA) has opened up in the 1970s. 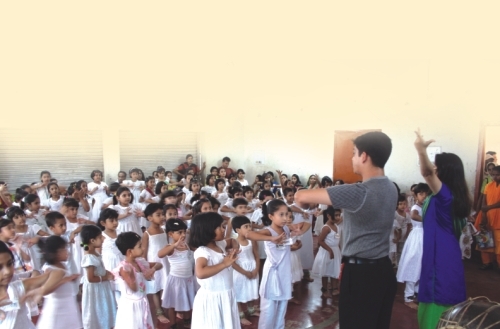 As for Tapan he enjoys teaching little children. "I feel happy that I teach students are taking dance lessons for thr first time in their lives." Tapan testifies that today guardians are eager to see their children learn singing and dancing. "They are so eager that along with their children some of the guardians show up in white clothes, which is the prescribed dress for students. Parents are as enthusiastic as the children, and it helps in nurturing the young talents," says Tapan. 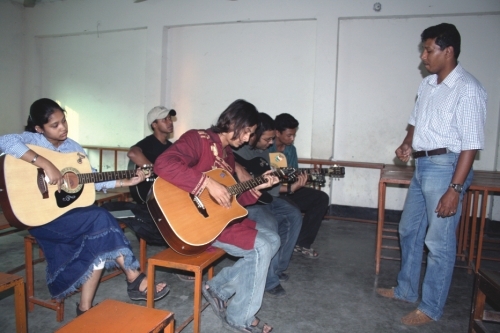 BAFA, the oldest art, dance and music academy in Bangladesh has its main branch in Wiseghat. Established in 1955 the academy expanded its activities by opening two branches one at Dhanmandi, which began in 1973, and another at Motijheel, which was launched in 1975. If one person can represent the history of BAFA it is Rahija Khanam Jhunu. "I was, at the onset, a student, then a teacher and now the principal of BAFA," says Jhunu. In the year 1955, she joined BAFA as a student of dance. She recalls her student life as vividly as if it occurred only yesterday. She also recalls how the initiation to BAFA took place. "I was a student of Gandaria Girl's School and the headmistress was Bashanti Guha Thakurata, who was very culturally inclined. Every year after the final exam there used to be a function where students got the chance to show their talents in performing arts. When I was in class five, Ajit Sanyal, who was one of the founders and a teacher of the newly established BAFA, was summoned to direct a dance drama called Ghumanto Rajkanya, in which I got the part of the cowboy. The role attracted a lot of attention as well as accolades from those who attended the annual function," remembers Jhunu who at the insistence of Sanyal joined BAFA. "I became one of those students who earned a scholarship. At BAFA, it was under the guidance of Sanyal that I started to take lessons in dance," recalls Jhunu. However, Sanyal did not stay with BAFA for long. "After his departure GA Mannan came along and it was around 1958 that an offer came for BAFA to stage a dance drama. Mannan was adamant that he would do Jasimuddin's Nakshikanthar Math. Though everyone else was skeptical about it, and thought it was not suitable for the audience of the city, he stuck to his resolve. And after rehearsing for three long months it was staged in the then Eskander Mirza Hall, which is now the Engineers' Institute. The show was a resounding success," remembers Jhunu. It is noteworthy that the drama was staged in the year 1958, and at that period there were only six to seven students in the dance class. Mannan's acumen lay in the fact that he could sense who was fit for what role. "Not only was Mannan determined to perform Jasimuddin's rural saga but also decided on using me as its heroine," recalls Jhunu. She was a young student of BAFA and had the look that suited the role. While authorities at BAFA did not have much confidence in the young Jhunu, Mannan let her through rigorous training and made her prepare for the lead role. Amanullah Chowdhury, the present secretary. 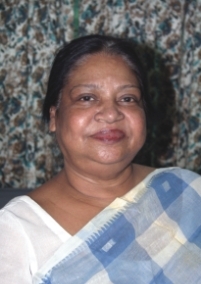 Rahiya Khanam Jhunu, the Principal. The dance drama, staged for the first time, brought immediate renown for its director and the actors. "Offers started to pour in and we travelled to most of the cities of the then West Pakistan with the drama. We even visited Iran and Iraq to stage the same act. It was in Iran that I earned the epithet of ballerina," recalls Jhunu. If the performances brought fame for Jhunu, it was her determination to stay with BAFA that whittled out her future course. Jhunu completed her certificate course in 1960 and joined immediately as a teacher at BAFA. It was in 1998 that she became the principal of the organisation with which her name and fame has got forever entwined. Reflecting on the era when she was taking dance lessons at BAFA, Jhunu says that there were only a handful of parents who wanted their children to grow up as artists. "At present that scenario has drastically changed. Parents of children are now ready to dedicate a lot of time to nurture the talent in their children," says Jhunu who feels that for the performing artists the opportunities are now plentiful. It was not so in the time when Jhunu was young. "To enter the domain of arts was unthinkable for a girl from any Muslim family during the 1950s and 1960s, as the predominant religious sentiment was that any art was anti religious," says Jhunu. Fifty years later the crowded rooms of BAFA attest to the fact that many parents are not only eager to see their childrens' knack for singing, dancing or painting turn into serious pursuit, they are willing to sacrifice their own time to oversee how the learning is taking place. In the junior sections of BAFA mothers are allowed to sit along the wall, and they willingly occupy that place to look over how the teaching is going on. BAFA's popularity can be traced to its total intake year round. "The number of students stands at around four thousand during admission. However many of them fail to continue as it later dawns on them that it is really tough to pursue studies in the arts," says Amanullah Chowdhury, secretary of BAFA. Although the office could not provide a dropout rate, Amanullah attests that among the four to five thousand that take admission one to two thousand fail to reach the final year. BAFA provides a four-year-long course for both children and adults. "In the senior section there is no age limit, so that anyone who crossed the age of 10 or 11 is eligible as a candidate, and this provides an opportunity for those who have a late awakening. Having students of various age is advantageous, students show more enthusiasm," says Naosheen Laila, who teaches Nazrul's song at BAFA. Naosheen became a popular name by winning several awards in the BTV organised Natun Kudi competitions when she was a child. BAFA's teaching body is replete with such renowned artists. This has been the strongest point of BAFA, and having a competent teaching staff has its results. "BAFA is an organisation that produced most of the talented artists of the country," Chowdhury points out. Over the years the influx of the candidates has mounted. "We have received a petition of five hundred parents from the Mirpur area who are pressing for opening a new branch over there. We have plans to expand from the next session. In fact our plan includes two new branches of BAFA, -- one in Mirpur and another in Uttara," Chowdhury points out. Sadly the government's financial assistance to BAFA is scanty. "We don't get much attention as does Shilpakala Academy, But our effort is not negligible. What I regret is that we cannot run courses of sitar or eshraj because of a dearth of teachers. Shilpakala can afford to run such courses, but they remain unrelenting to such demands. 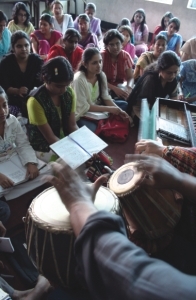 It is not only financial and logistic constraints that keep us from introducing courses in sitar or eshraj, space is also a big concern for BAFA," says Chowdhury. As for private patronisation, BAFA has failed to involve the business community in many occasions. "There was an occasion when our artists had an offer to stage programmes in the USA. But, since we failed to raise the passage money, the programmes were cancelled. I literally went door to door with the hope that the corporate giants would extend their support, but I failed to raise the much needed passage money," laments Chowdhury who feels that the artists were better off in the olden days. "There were zamindars who used to patronise them," adds Chowdhury. It is interesting to notice that while there is an absence of patrons, there has been a rise in the number of pupils who want to cultivate their talent in arts. And it is in BAFA that the ones who are able to show their acumen in their respective fields are given the chance to participate in state-level functions. "There once was a time when BAFA was the only organisation that the government used to resort to when it came to staging state-level functions. After the inception of Shilpakala Academy, it is through the academy that artists are being selected. However, as Shilpakala does not have their own artists it is from organisations like BAFA that they make their selections. As far as participation in the state-level functions are concerned, BAFA's artists have remained at the forefront," says Chowdhury. BAFA was the result of a concerted effort by Mahmud Nurul Huda and his friends. It was to commemorate the ace dancer of the country Bulbul Chowdhury, who died an untimely death in 1954, that the academy's name was chosen. 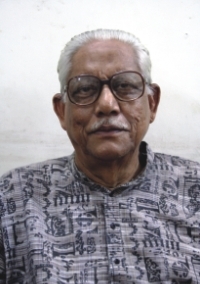 The present Secretary Amanullah Chowdhury was elected to the executive committee of BAFA as its treasurer in 1967. Chowdhury took over the responsibility at a critical juncture when BAFA's very existence was under threat. And on top of that, right after the liberation war government donation, which stood at one lakh fifty thousand taka before the independence of Bangladesh, dwindled to a mere twenty five thousand following independence. When in 1974 Chowdhury was elected as the secretary of BAFA, the institution had already incurred a huge debt and was nearing closure. Chowdhury with the help of the executive committee members, late Principal Bedar Uddin Ahmed, and late Head of the Department of Music and Direction Atikul Islam, former Head of the Department of Dance and the present Principal and the wife of the secretary Rahija Khanam Jhunu and the dedicated teachers made efforts to save BAFA. 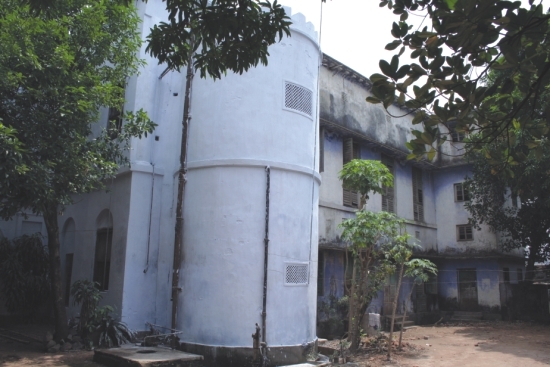 As the secretary, Chowdhury's first step was to buy the building that houses the main branch at Wiseghat. "We contacted the owner and made several payments over the years, but still the premises doesn't belong to BAFA because of legal complications," says Chowdhury who even met with the then president Ziaur Rahman regarding the matter. "The untimely death of Ziaur Rahman dashed our hope of acquiring the land and the building that houses the main branch," says Chowdhury. "If only we had a building of our own, we could've expanded our activities without much hesitation," adds Chowdhury. It is the competence of teachers on which rests BAFA's reputation. Chowdury's preferred slogan for BAFA is, "To keep your children away from terrorism and addiction, nurture them as art aficionados." This view is shared by the teaching staff. 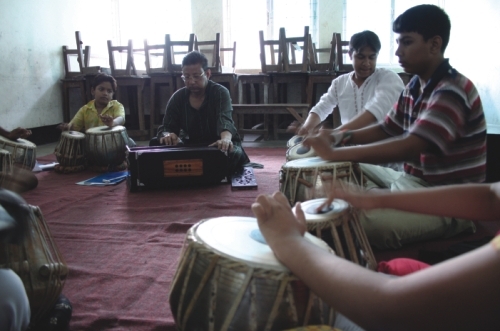 Ustad Sabbir Mokammel, who teaches tabla at BAFA, feels that the organisation has immense potential in diverting a generation from drug addiction to culture. "All BAFA needs is government support," he adds. And as a final exclamation Chowdhury says that to uphold the national culture there is no other way but to nurture the talents of the children. BAFA has successfully completed its fifty years; and has maintained its reputation as an organisation that brought to light a myriad of artists is only soaring. After considering its past record one can sense that BAFA has a lot more to offer in the years to come. Bulbul Chowdhury was a dancer with a difference. It is for his innovations as well as perseverance that he is ranked with the likes of Uday Shankar, the outstanding Indian dancer. He was born in Bogra, where his father used to work. His father, Md Ajim Ullah, hailed from Satkania, Chittagong. It was in 1834, in a school at Manikganj, that Bulbul first had the chance to perform a dance called "Chatak dance". The first attempt was received with much enthusiasm on the part of the audience. Since the beginning of 1936 Bulbul started to perform on a regular basis. His ability to articulate a vision and his knack for appropriating both classical dance and the postures of the fishermen, snake charmers, and peasants engaged in their everyday activities have earned him a unique place in the domain of art. The Kolkata based newspapers of the period testified how he touched the audience with his innovative blend of classicism with modern day techniques. After partition of India in 1947, Bulbul faced a hostile environment in the then East Pakistan. It is at this point that twofold problems faced him, one of rearing of talents who could accompany him in his dances, and the other of religious conservatism that stood against his effort to stage dance dramas throughout the country. However, he successfully continued his practice and even came to the notice of the people at the helm of the Pakistan government. Prime Minister Liaquat Ali Khan once described him as the cultural ambassador of Pakistan. Bulbul's life summarily ended in May 17, 1954. What he left behind was a body of work that consisted of dance dramas composed by him and performances of renowned dance dramas that he considered to be the inheritance of his own people, to whom he connected through his art. It is his life's work that inspired Begum Rana Liaquat Ali, the first president of BAFA, and Mahmud Nurul Huda, the first Secretary of BAFA, with AK Fazlul Haq as the chairman and Hossain Shahid Surwardy as a patron that this institute that bears the name of Bulbul was launched. There were many other socialites as well as artists whose dedication made the launching of BAFA possible in a climate where there was strong opposition to cultural practices.